Reproduction of the WWII German Army Enlisted Man's Afrika Korps M41 Tropical Field Cap issued to the Wehrmarcht. 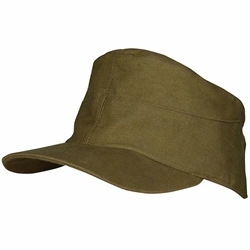 Excellent quality heavy cotton twill fabric in the correct olive green color (Luftwaffe caps are tan). Comes in the correct teardrop shape, full sized tropical brim and made with red inner cotton material. Marked in German sizes and corresponding US hat sizes. This EM model Afrikakorp cap is Olive Green. Sizes: 56 (US size 7), 57 (US size 7-1/8), 58 (US size 7-1/4), 59 (US size 7-3/8), 60 (US size 7-1/2) 61 (US size 7 5/8). Please Note: Some caps come with a cockade, some don't. Sorry no choice.